The Data Science team at Greenhouse Group is steadily growing and continuously changing. This also implies new Data Scientists and interns starting regularly. Each new Data Scientist we hire is unique and has a different set of skills. What they all have in common though is a strong analytical background and the practical ability to apply this on real business cases. The majority of our team for example studied Econometrics, a study which provides a strong foundation in probability theory and statistics. As the typical Data Scientist also has to work with lots of data, decent programming skills are a must-have. This is however where the backgrounds of our new Data Scientists tends to differ from each other. The programming landscape is quite diverse, and therefore, the backgrounds of our new Data Scientists cover programming languages from R, MatLab, Java, Python, STATA, SPSS, SAS, SQL, Delphi, PHP to C# and C++. It is true that knowing many different programming languages can be useful when necessary. However, we prefer the use of one language for the majority of our projects so that we can easily cooperate with each other on projects. And given that nobody knows everything, one preferred programming language gives us the possibility to learn from each other. At Greenhouse Group we have chosen to work with Python when possible. With the great support of the open-source community, Python has transformed into a great tool for doing Data Science. Python’s easy to use syntax, great data processing capabilities and awesome open-source statistical libraries such as Numpy, Pandas, Scikit-learn and Statsmodels allow us to do a wide range of tasks varying from exploratory analysis to building scalable big-data pipelines and machine learning algorithms. Only for the lesser-general statistical models we sometimes combine Python with R, where Python does the heavy data processing work and R the statistical modelling. I also strongly believe in the philosophy of learning by doing. Therefore, to help our new Data Scientists get on their way with doing Data Science in Python we have created a Python Data Science (Crash) Course. The goal of this course is to let our new recruits (and also colleagues from different departments) learn to solve a real business problem in an interactive way and in their own pace . Meanwhile, the more experienced Data Scientists are available to answer any questions. Note that the skill of Googling for answers on StackOverflow or browsing through the documentation of libraries should not be underestimated. We definitely want to teach our new Data Scientists this skill too! In this blog we describe our practical course phase by phase. The first step obviously is learning Python. That is, learning the Python syntax and basic Python operations. Luckily, the Python syntax is not that difficult if you take good care of indentation. Personally, coming from the Java programming language where indentation is not important, I made a lot of mistakes with indentation when I started with Python. So, how to start with learning Python? Well, as we prefer the learning by doing approach we always let our new recruits start with the Codecademy Python course. 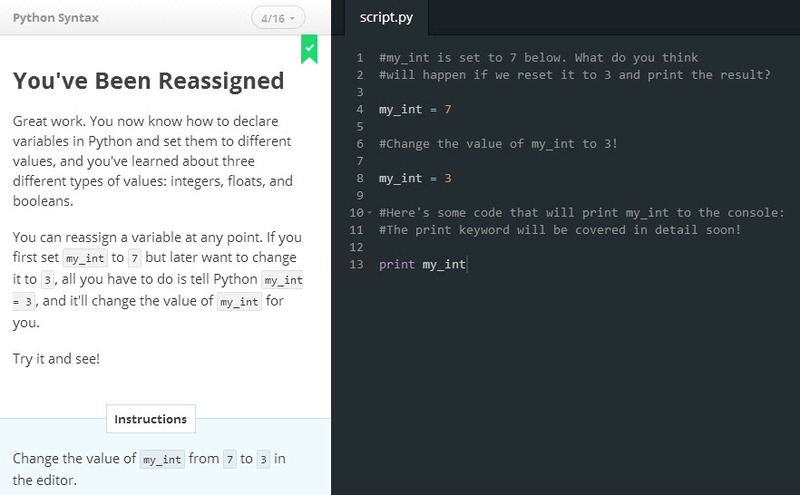 Codecademy provides an interactive Python course which can be followed in the browser. Therefore, you do not have to worry about installing anything yet and you can start immediately with learning Python! The Codecademy Python course takes about 13 hours to complete. After this, you should be able to do simple operations in Python. Bonus tip: another useful Codecademy course for Data Scientists is the SQL course! After finishing the Codecademy course we obviously want to start developing our own codes. However, since we are not running Python in-browser anymore we need to install Python on our own local PC. Python is open source and freely available from www.python.org. However, this official version only contains the standard Python libraries. The standard libraries contain functions to work with for example text files, datetimes and basic arithmetic operations. Unfortunately, the standard Python libraries are not comprehensive enough to perform all kinds of Data Science analysis. Luckily, the open-source community has made awesome libraries to extend Python with the proper functionality to do Data Science. To prevent downloading and installing all these libraries separately, we prefer to use the Anaconda Python distribution. Anaconda is actually Python combined with tons of scientific libraries, so there is no need to manually install them all yourself! Additionally, Anaconda comes bundled with an easy commandline tool to install new or update existing libraries when necessary. Tip: although allmost all awesome libraries are included by default in Anaconda, some of them are not yet. You can install new packages from the command line using conda install package_name or pip install package_name. For example, we regularly use the progressbar library tqdm in our projects. Hence, we have to execute pip install tqdm first when performing a new install of Anaconda. To make our lifes easier, we prefer to develop our Python codes in Pycharm. PyCharm is a so-called integrated development environment which supports developers when writing code. It takes care of routine tasks such as running a program by providing a simple run script button. Additionally, it also helps being more productive by providing autocomplete functionality and on-the-fly error checking. Forgot a space somewhere or used a variable name that is not defined yet? PyCharm will warn you. 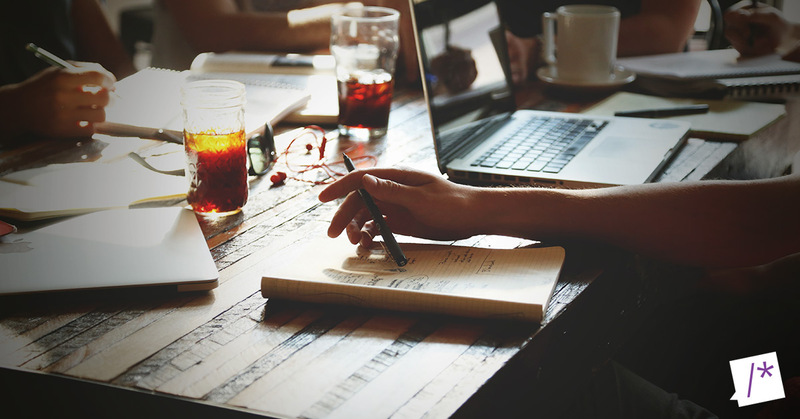 Want to use a Version Control System such as Git to cooperate on projects? PyCharm will help you. One way or another, using PyCharm will save you a lot of time when writing Python code, because it works like a charm... badum tss. So, assume that by now our manager has come to us with a business problem he faces. More pageviews leads to a higher probability of engaging for the first time. Session data containing all pageviews of all users. Unfortunately, we have two separate datasets because they come from different systems. However, users in both datasets can be matched by a unique user identifier denoted by user_id. Just like earlier blogs, I have placed the final code to solve the business problem on my GitHub. However, I would strongly recommend to only look at this code when you have solved the case yourself. Additionally, you can also find the code to create two fictional datasets yourself. Before we can apply any statistical model to solve the problem we need to clean and prepare our data. For example, we need to find for each user in the sessions dataset his first engagement, if any. This requires joining the two datasets on user_id and removing any engagements after the first. The Codecademy Python course taught you already how to read text files line by line. Python is great for data munging and preparation, but not for data analysis and modeling. The Pandas library for Python helps to overcome this problem. Pandas offers data structures and operations for manipulating (numerical) tables and time series. Pandas therefore makes it much easier to do Data Science in Python! The first step in our Python code will be to load both datasets within Python. Pandas provides an easy to use function to read .csv files: read_csv(). Following the learning by doing principle we recommend you find out yourself how to read both datasets. In the end, you should have two separate DataFrames, one for each dataset. Tips: we have different delimiters in both files. Also, be sure to check out the date_parser option in read_csv() to convert the UNIX timestamps to normal datetime formats. The next step in any (big) data problem is to reduce the size of your problem. In our case, we have lots of columns which are not relevant for our problem, such as the medium/source of the session. Therefore, we apply Indexing and Selecting on our Dataframes to only keep relevant columns such as the user_id (necessary to join the two DataFrames), datetimes of each session and engagement (to search for the first engagement and sessions before that) and the number of pageviews (necessary to test our hypothesis). One of the most powerful options of Pandas is merging, joining and concatenating tables. It allows us to perform anything from simple left joins and unions to complex full outer joins. SO, combining the sessions and first engagements DataFrames based on the unique user identifier... you've got the power! Using a simple merge in the previous step we added to each session the timestamp of the first engagement. By comparing the session timestamp with the first engagement timestamp you should be able to filter out irrelevant data and reduce the size of the problem as well. As stated, we want to predict the effect of pageviews on the conversion (i.e. first engagement) probability. Therefore, our dependent y variable is a binary variable which denotes whether a conversion has taken place within the session. Because of the filtering we did above (i.e. remove all non-first engagements and sessions after te first engagement), this conversion by definition takes place in the last session of each user. Again, using the GroupBy: split-apply-combine logic we can create a new column that contains a 1-observation if it is the last sessions of a user, and a 0-observation otherwise. Our independent variable is the number of pageviews. However, we cannot simply take the number of pageviews within a session, because pages visited in earlier sessions can also affect the conversion probability. Hence, we create a new column in which we calculate the cumulative sum of pageviews for a user. This will be our independent variable X. Using Pandas we finally ended up with a small DataFrame containing of a single discrete X column and a single binary y column. A (binary) logistic regression model is used to estimate the probability of a binary response of the dependent variable based on one or more independent variables. StatsModels is a statistics & econometrics libary for Python with tools for parameter estimation & statistical testing. Therefore it is not surprising that it also contains functions to perform a logistic regression. So, how to fit a Logistic regression model using StatsModels? Let me Google that for you! 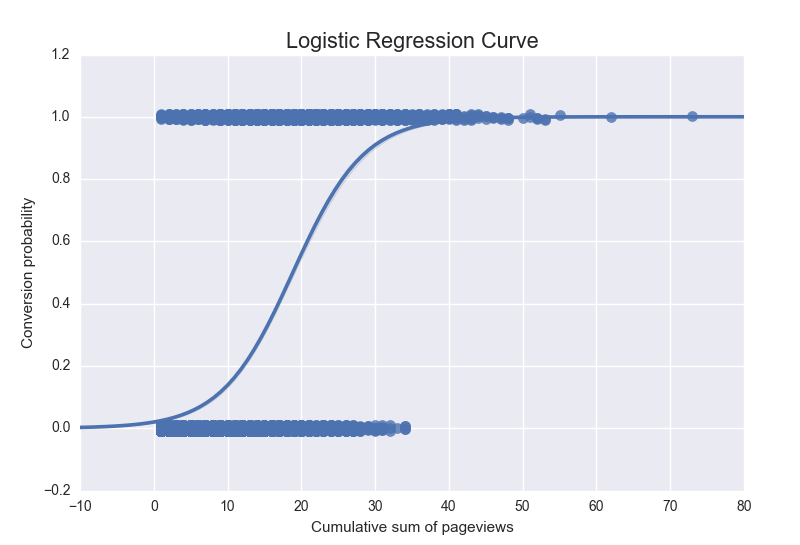 Tip 2: another awesome libary to fit statistical models such as logistic regression is scikit-learn. Python contains several awesome visualization libraries of which MatplotLib is the most well-known. Seaborn is another awesome libary built upon MatplotLib. The syntax of MatplotLib is probably well-known to users who worked with MatLab before. However, our preference goes to Seaborn as it provides prettier plots and appearance is important. We can nicely use this visualization to support our evidence on whether our hypothesis holds. For one, from our previous visualization it already follows that the hypothesis holds. Otherwise, the predicted probabilities would not be monotonically increasing. Nonetheless, we could also draw the same conclusion from the summary of our fitted model as shown below.